Bulging disc in the cervical spine. 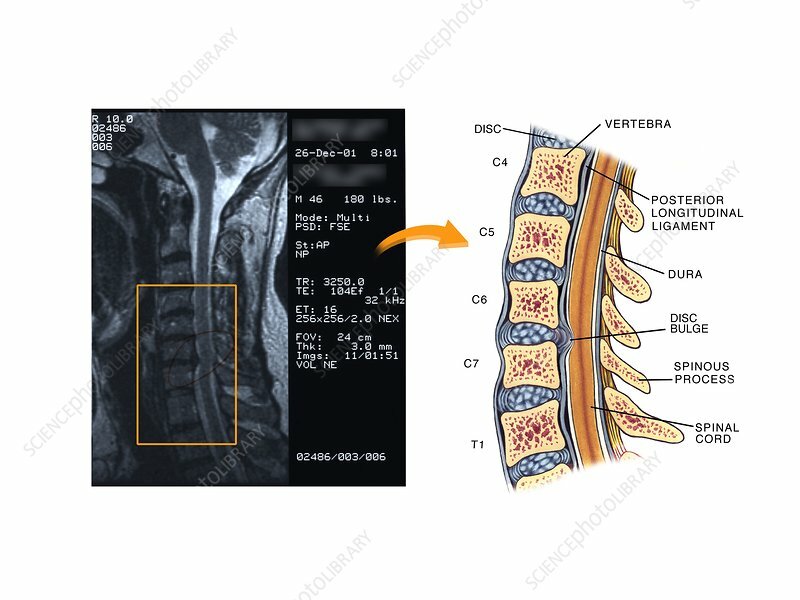 Labelled artwork and corresponding sagittal MRI (magnetic resonance imaging) scan through the cervical spine showing a disc bulge between the C6 and C7 vertebrae. This bulge, caused by a trauma (injury), is pressing on the spinal cord (brown). The dura mater, posterior longitudinal ligament, and spinous processes, are also labelled. The cervical spine is the part of the backbone found in the neck. The front of the spine is at left. The discs of fibrocartilage between each vertebra form joints that allow the spine to bend and flex. Spinal disc bulges, especially those caused by injury, can result in pain similar to that caused by disc herniation.